Thank you to Audiofile Magazine for reviewing FEVER 1793 by Laurie Halse Anderson, produced by Tantor Audio. "Narrator Bailey Carr gives a contemporary edge to 14-year-old Mattie in this new production of a stellar historical novel." Front Page of The New York Times! The back of my head was on the very FRONT PAGE of this Sunday's New York Times! Pretty cool! Thanks Esther & Audible Studios! the Audies 2018 Red Carpet LIVE at the New York Historical Society! April Fools from Audible Studios! I had so much fun being a part of Audible Studios' delicious April 1st project: Menu Excerpts from Our Favorite Newark Restaurants - along with Victor Bevine, Therese Plummer, Cassandra Campbell, Nick Podehl, & Eric Michael Summerer. Download it now for FREE! NEVERTHELESS WE PERSISTED nominated for an Audie Award! I'm incredibly honored to be one of the 26 narrators of this very special project! Eternal gratitude to fearless leader and fierce creator Tanya Eby of Blunder Woman Productions & the rest of the dream team that collaborated to bring these extraordinary and powerful stories to life! Click here to view all the nominations! The Nocturnals on KidLitTV for World Read Aloud Day! Thank you so much to The Nocturnals & KidLitTV for having me on to read live from The Mysterious Abductions and to celebrate World Read Aloud Day! Thank you to Audiofile Magazine for reviewing NEVERTHELESS WE PERSISTED produced by Blunderwoman Productions! This special project was written by 32 authors and performed by 25 narrators. Audiofile calls it a "powerful volume of life-affirming poetry and prose" and says "for those in need of an uplifting listen, this will become a fan favorite." Thanks so much to Blunderwoman Productions for the introduction as a part of the upcoming audiobook NEVERTHELESS WE PERSISTED created by 32 authors and voiced by 25 narrators. I voiced GIRL, 25 by Lily Schmidt. Grateful to be a part of this project. Keep on keeping on! Click here to view on the Blunderwoman Productions blog! Thanks so much to The Candid Cover for a fun review of the audiobook of Riley Redgate's NOTEWORTHY! "I’m so glad to say that my experience with Noteworthy as an audiobook was an incredible one. When I first hit play on the book, I actually recognized the narrator from Morgan Matson’s The Unexpected Everything. Bailey Carr is such a perfect voice for Noteworthy since she is able to capture the sarcastic undertones of Jordan’s thoughts so well. She also does a surprisingly good job with the male voices, which couldn’t have been easy, considering there are 7 boys in the Sharpshooters. If you are looking for a good audiobook to listen to, I would definitely recommend this one for its perfect laugh-out-loud narration. 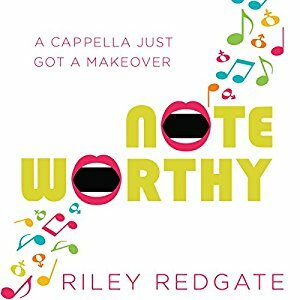 Noteworthy is the hilarious story of a girl who disguises herself as a boy to join a male a cappella group. I loved the boarding school setting and the main character’s relatability. The narration in the audiobook edition is perfectly sarcastic and adds even more enjoyment to the story. If you have yet to pick up this wonderful book, I strongly encourage you to do so as soon as possible!" BLAME by Jeff Abbott is a Strand Mag Top 10 of the Summer! one of your Top 10 Audiobooks of the Summer! Earphones Award for MIDNIGHT AT THE ELECTRIC! Excited to share MIDNIGHT AT THE ELECTRIC by Jodi Lynn Anderson has won an Audiofile Earphones Award! I co-narrated with Jorjeana Marie & Fiona Hardingham. Thanks to Harper Audio & Commonmode Inc. for the chance to tell this one-of-a-kind story! Click here to view on Instagram! WHEN THE MOON WAS OURS is Audible's Daily Deal 6/26/17! MIDNIGHT AT THE ELECTRIC featured on HarperAudio's Twitter and Instagram! MIDNIGHT AT THE ELECTRIC by Jodi Lynn Anderson is an amazing, totally unique book I can't stop thinking about! The author calls it "a classic girl meets Dust Bowl meets girl meets Mars meets ancient tortoise story." I was so honored to narrate this book along with Jorjeana Marie and Fiona Hardingham. Thanks so much to HarperAudio! Click here to view on Twitter! WHEN THE MOON WAS OURS 🌙 by Anna-Marie McLemore co-narrated with Raviv Ullman is in the Feb/March Audiofile Magazine! DON'T YOU TRUST ME on The Audiobookworm's Top 12 of 2016! Honored DON'T YOU TRUST ME by Patrice Kindl is listed as one of The Audiobookworm's Top 12 Audiobooks of 2016! Click here to see The Audiobookworm's Top 12 of 2016 list! Click here to read The Audiobookworm's review! Over the moon! 🌙 Thank you to Audiofile Magazine and Audible Studios for the stellar review of the audiobook of WHEN THE MOON WAS OURS by Anna Marie McLemore. Listen to an extended 12 min sample from Chapter One of STEALING SNOW by New York Times Bestselling Author Danielle Paige on the Audible Studios Soundcloud! From Danielle Paige, the New York Times best-selling author of Dorothy Must Die, comes a reimagining of "The Snow Queen" fairy tale. Seventeen-year-old Snow has spent the majority of her life within the walls of the Whittaker Institute, a high-security mental hospital in upstate New York. Deep down she knows she's not crazy and doesn't belong there. When she meets a mysterious, handsome new orderly and dreams about a strange twisted tree, she realizes she must escape and figure out who she really is.